Details: 3 Bedroom, 3 Bathroom Beach Home with 1,800+/- square feet. 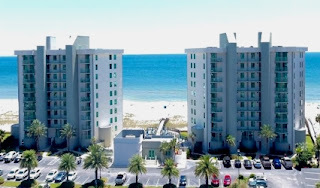 Perdido Tower condo for sale in Perdido Key Florida. This beachfront home has a spacious floorplan with stunning views of the Gulf - the floor-2-ceiling windows will make you feel like you are on the beach! This condominium is professionally decorated with ample space for entertaining friends & family, including a large kitchen with generous cabinets and counter space for those who love to cook. The private, Gulf-front Master Suite features floor-to-ceiling windows which show off unobstructed views of the Gulf of Mexico...and the windows open so you can listen to the waves rolling over the shores of Perdido. The split floor-plan has the two guest bedrooms at the north side of the residence, each with en-suite bathrooms and access to a balcony. Perdido Towers amenities include a beachfront pool, tennis courts, fitness facility, boat docks & more. Come see this condo!